Would a 64 GB iPhone affect your buying decision? Dream specs or unnecessary frill? New reports surfaced late Thursday night that the next iPhone (s aapl) could come in a 64 GB flavor, according to Apple inventory system information obtained by 9t05Mac. A doubling of internal storage is a reasonable expectation for Apple’s iPhone 5; in fact, many expected it the last time around. But how much of an impact will more storage capacity have on your buying decision? I wonder, because 32 GB of storage has suited me well now for two generations of iPhone, and I’ve yet to run up against that limit. I have an iTunes library that’s much larger than 32 GB on my Mac, but cycling content in and out is actually something I enjoy, because it keeps my music fresh. Even storing hundreds of photos and apps on my iPhone, as well as a few short HD videos shot with the iPhone 4 hasn’t threatened to put me over the edge. Apple’s iTunes Match service, which will allow users to store their entire iTunes library in the cloud and download tracks selectively whenever they have an active network connection (Wi-Fi or 3G) should make on-device storage even less of a concern. So, too, does the newly introduced ability to download past purchases of books and apps quickly and easily, without having to remember which ones you bought in the first place. In general, iCloud seems designed to make on-device storage less of an issue for users. On the other hand, if a new iPhone can take higher resolution photos and videos and handle more powerful apps, extra space may be appreciated. If Apple introduces a 64 GB tier to their lineup and prices their new iPhones they way the company has in the past, the 32 GB version of the iPhone 5 will be only $199 on contract, a $100 discount when compared to the 32 GB iPhone 4. For me, even though I’ve always opted for the largest capacity device Apple offers, the cheaper iPhone 5 looks like a much better deal, based on my past usage. So I’m curious; how many out there would buy a 64 GB iPhone 5 over a 32 GB version, should one be made available? That said, more storage is always better, especially in a mobile or portable device. Cloud storage is not a good replacement for on-device storage because connectivity is not always available everywhere, and when it is it isn’t always very fast. Additionally, with wireless carriers adopting usage caps and throttling strategies, you are better off keeping your media on the device, transferring from your home computer or fast WiFi connection. I’m a pro photographer and I’d buy a 128GB iPhone 5 if it became available. Even now, I need a 64GB version. Why? Because I also need to carry additional photo and video content on my iPhone (copies of portfolio photos and videos made with the pro cameras I also use). Given the larger music, photo and video files that are coming with the 8 megapixel camera that reportedly will be included in the iPhone 5, a 64GB model only would ensure that the next product remains the functional equivalent of the current, 32GB iPhone 4. Graphics professionals need a 128GB option now to gain capabilities we don’t yet have. Apple’s iCloud may alleviate some of these needs, but realistically (for the next couple of years), only if you’re within range of a fast, 802.11n WiFi hotspot. Once 4G LTE networks become widely available on most carriers, things may be different (assuming the damn bandwidth caps are a temporary, transitional limitation). Since its 2007 introduction, the iPhone has been one generation behind the actual storage needs of graphics professionals. Still, the iPhone is (by far), the very best mobile phone/computer tool available for photographers. Android isn’t even a consideration. Need more definitely. The only reason I keep my 60gb iPod alive (on it’s 3rd battery now), is because I play my iPod in the car and want to have my whole music library with me. If and when they release a 64gb, I can finally retire it. I need it bad. My 32GB iPhone always has 30GB on it. It’s a deal breaker for me. I have a 32 Gig and I am COMPLETELY out of space. And it is defenatly affecting the functioning oft phone. I have only 2500 songs and I want them ALL. I have 500 apps, and sure, I could thin that down a bit, but I don’t want to. I just bought a SGSIIE4GT. So, no. I was sorely disappointed that 64GB was not available on the iPhone4. 64GB to me is an absolute minimum to to hold my music content (and “compressed to 128” at that). 128GB would be much better, and I’m sure I’m not alone in being gladly willing to pay extra for the convenience! Doesn’t really surprise me that much, the technology is obviously there to put it in so there’s no reason they wouldn’t that I can think of, they can also probably mark it up a bit more. 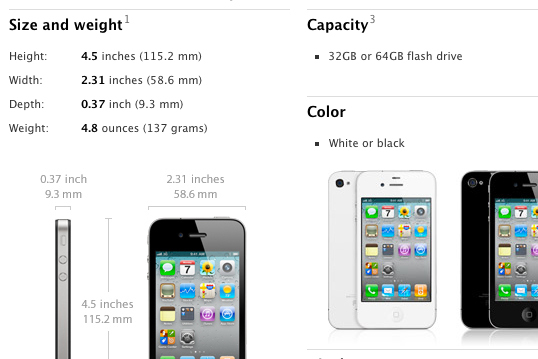 Also wouldn’t be surprised if the next iPod Touch is 128GB. Depends on how well iCloud works with music. I have over 40 gigs of music that I would like to have access to when I want it. That seems like a good deal…too bad it’s based on rank speculation. That is why he used the word “if.” Everything is speculation regarding new iPhones until October 4th. My wife has gotten into recording video with her iPhone so would love to have a 64GB version. For me, 16 GB is enough.